Help! My new MMD model has no English bone names and is missing all of the Facial adjustments! Why are the Facial adjustments blank? Why can I see the facials only in Japanese mode? Translate Japanese Models into English! Your Japanese PMD models will be so much easier to use! Have you ever noticed missing facials when you load a Japaneses model into the English version of MMD? Or have you ever wanted to attach an accessory to a particular bone… and all you find is a long list of Japanese names… Or an incomplete list… or no list at all!? There is a simple way to fix that! The method is pretty straight-forward… and surprising! 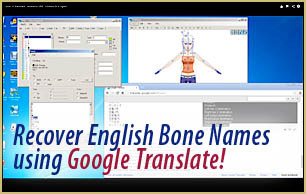 You navigate through the lists of Japanese bones in PMDE, copy/paste entire lists at a time into the window at translate.google.com with the translator set to translate Japanese into English. The result is a list of bone names in English. You can then copy/paste that bone list into the appropriate PMDE window … and you’re done! Please watch my Video Tutorial (above) and be sure to follow-along, carefully. Also be sure to rename your new English model BEFORE you SAVE anything, so that your original model will stay safe. Thank u for this tutorial it helped me a lot!!!!!!!!! !